To set up Snake Oil, each player takes six purple word cards. The customer for the round draws a red customer card and announces it. Inventors quickly combine two purple word cards from their hand to form a crazy new product to sell to that customer. When ready, they put their two word cards face down on the table. In clockwise order, each inventor quickly pitches his or her product directly to the customer. The customer can end any pitch that goes longer than thirty seconds. The customer decides which product to buy and gives the inventor of that product the round's customer card as the prize. Inventors discard all used word cards and take two new word cards each. The player to the left of the customer becomes the next round's customer. Play repeats until each player has been the customer once. This game plays very similar to Apples to Apples. One person is a random customer (this role rotates) and draws a card saying who that person is (a parent, an alien, a cheerleader, etc.). Everyone else is a traveling salesman trying to pitch a product to the customer by combining 2 of their cards then giving a sales pitch. The customer then selects the “best” product/pitch based on their opinion. The salesmen draw new cards and the customer rotates to the next player and they select a different identity. This is a silly game. It’s not necessarily the cards you get but how you sell them. Some people would put out some really confusing card combinations and launch into a great and hilarious sales pitch that would win them the sale. Also, since you have no time to really think through the product, you can unintentially create very bizarre products with unintended consequences (kind of like real products sometimes). In our group, the other salespeople would make comments pointing out flaws, or asking probing questions and that made it more fun. Others would have great cards that kind of sell themselves and would win only on the strength of the cards. A lot of it is random, and you may be stuck with cards that you don’t know how to sell and you spend turns just basically discarding worthless terms. Also, in the first time we played with 5 people, we went through most of the customer deck (customer cards are double sided, but we picked the side we liked more, meaning the other side was less interesting to us), so I can’t really see us playing it more than once or twice a year. Some people are really, really good at selling bizarre products and others do not enjoy it. If the people you play with don’t get into the theme, then it’s just not going to be fun. All in all, it’s worth a play depending on who is coming over. It’s good as a gift for people who like party games, but it’s not a game I would probably buy for myself. 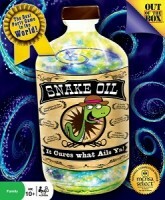 Snake oil is a terrific game that allows players to hawk their wares as an old time snake oil salesman. Each player is dealt a hand of cards containing words that can be used to create a product. Each turn, one person will serve as the judge for the round. They draw a card to reveal who is the buyer. They could be a caveman, an astronaut, etc. What makes the game interesting is that you never know who you will be selling your product to. Once you know who you’re selling a product to, it’s time to develop a product. You take two cards from your hand and use them to create a product. For example, you might try using wind and wig to create the windwig, a perfect wind resistant hair piece for the adventurous pilot. Then, it’s your job to pitch your product by describing it to your client and telling them exactly why they can’t live without it. After everyone describes their product, it’s up to the judge to determine who had the product they couldn’t live without! When my game group plays, we usually let they player who won the round hold on to the card for the buyer to keep track of score. We also allow people to spend a buyer card they won to redraw their hand of items. Since this is a storytelling game, the experience will vary between groups. With a good group of creative people who can get in the moment while pitching their product, this game is amazing. Easy to Learn 10/10: This can be picked up by new players within 5 minutes. Components 8/10: Nice artwork on the cards, which themselves are of decent quality. Replay Value: 10/10 This game is extremely adaptable, we have actually added in Cards Against Humanity and Superfight cards to add more variety. The base game can be played for hours with all ages. The replay value comes from the players, since this game really gives back what you put in. It is a great platform for creative, funny storytelling. Add a Review for "Snake Oil"